If you’re thinking of writing your wedding wishes and trying to put a smile on the faces of the couple at the same time, then you’re in the right place. There’s nothing like good humor or comic relief to make your card stand out, especially if you’re a close friend or family. We have here ideas for a number of funny wedding cards; you just have to decide which way you choose to go. 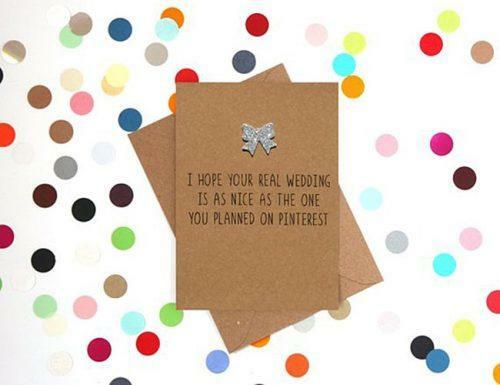 Funny wedding cards are cards written with a little extra attention and usually even a little more love. Usually written by someone close to the bride and groom, the kind of relationship that exists also determines the type of funny. These cards are sent as congratulatory wedding wishes to the couple; and with the right amount of funny, can be a delight to read. This is why when wording your wedding congratulations card, you don’t want to cross from funny to offensive. You need the humor to be just right for the occasion. And so we have listed here some samples and even some funny wedding quotes to help you along the way. 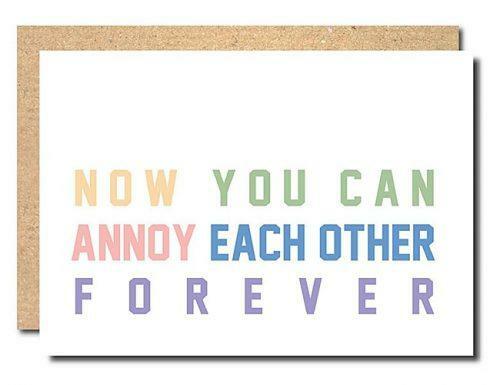 These are great ideas for inspiration in writing your own perfect funny wedding card. While there is a simple, more somber side to weddings, it doesn’t hurt to insert some humor, especially for the bride and groom. 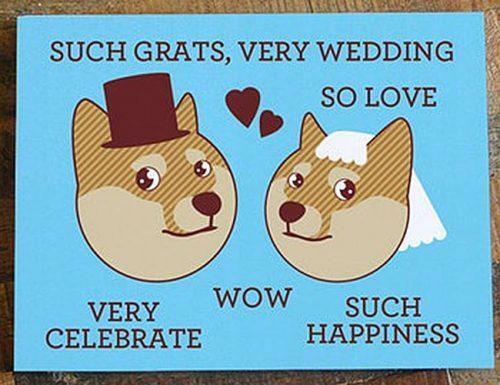 With all of the preparation and stress, it would be nice to have a wedding congratulations card to laugh too. Weddings should be all about boring. We have here examples of funny wedding quotes, readings and proverbs. You could even use some of these when giving a toast to the happy couple on their wedding day. 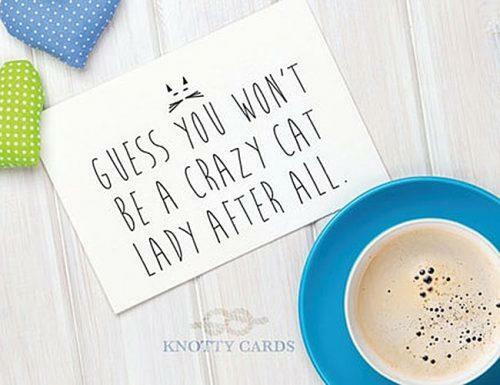 Funny wedding cards can be a joy to read and a fun quote or two can turn a boring ceremony into a fun wedding. 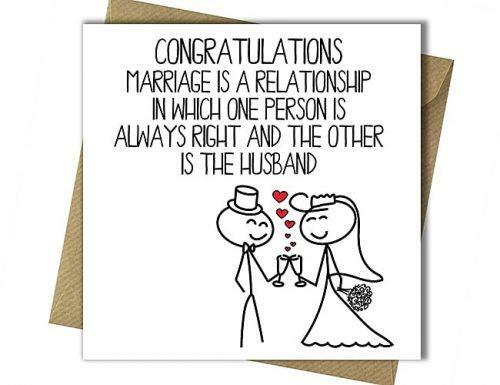 So, consider writing a funny phrase on your wedding day card to the benefit of the couple. Love is a global feeling, and there’s no love if you can’t have a little fun. These quotes are from writers all around the world and can be used in your wedding wishes or even on the cards for your engagement gifts. 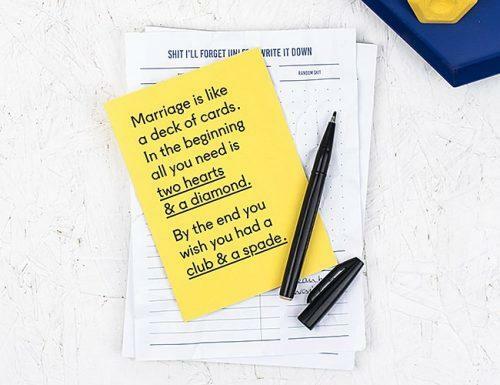 Add a little spice to your wedding cards with funny love quotes. A true soul mate is probably the most important person you’ll ever meet because they tear down your walls and smack you awake. Why do married people live longer than single people? I think it’s because married people make a special effort to live longer than their partner – just so they can have the last word. So many ways to express your love to the couple with some added humor. If this is your intention, then a few love sayings could do the trick. Make your wedding card stand out with a dash of silliness that will surely make the recipients smile. I now pronounce you husband and wife. You may now update your Facebook status. A few funny phrases you could use during the ceremony; perhaps while giving a toast or during the reading. This is usually during the reception after all the serious moments are over and it’s time to have some fun. 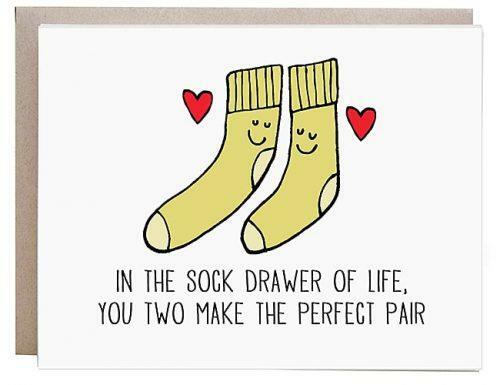 Or, you could use them on your wedding card too. I canceled all my appointments and an important meeting just so that I could make it to your wedding. After all, free food and booze were just too lucrative to give up. Congratulations. A very prominent topic in all of life and history, love is. So are funny readings about love. While there are romance, emotion and serious decisions, love also includes aspects of fun. These are depicted in the funny readings below which you can use when writing your wedding cards. Use as is, or use for inspiration; either way, they should be helpful. These proverbs have transcended time and sometimes are wrapped in the cultures that created them. Nevertheless, they are a delight to read and great to send to the couple that you love. These can even be used in wedding invitation wording. Nothing like a sweet and wishful proverb to end your wedding wishes. May your pockets are heavy and your heart is light. May good luck pursue you each morning and night. May joy and peace surround you, contentment latches your door. And happiness is with you now—and bless you evermore. Some type of metaphors funny pairings are, but a fun way to describe the love between two people. Just one more way to add the spice to your funny wedding card. Looking for inspiration and ideas, perhaps try some of these. A little bit of fun goes a long way in wedding preparations and the entire wedding process. It helps to put a smile on the faces of the busy couple. It also helps keep your wedding card memory to add some light and much welcome humor. Whether you need humor for your wedding wishes, toasts at the wedding, a wedding reading or even to wrap your engagement gift in. These funny phrases are diverse enough to use in any and every aspect of the wedding process. Thus, there are many different types of wedding cards, invitations, thank you cards, and so on. Looking for ways to address an invitation? We have your back too. 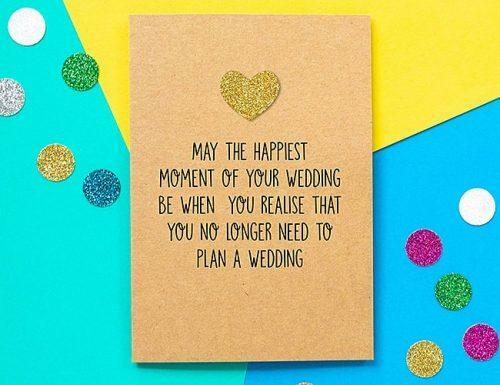 We hope we have been helpful however in your journey of writing funny wedding cards.